Ocassionally Amazon offers a few Kindle books for free (I receive a daily list from BookBub [that’s my unofficial plug for a free service]), and as I recall this was one of those freebies. I was impressed with the star rating on Amazon and, as I enjoy sci-fi and YA, this seemed like the right choice for me. Being a YA novel, we know that we will see a teen with abilities better than most, and someone daring, and perhaps reckless, and we are not disappointed here. Author Cidney Swanson does a nice job creating a a typical 17 year old girl, despite her fantastic ability as a pilot and growing up on a world unfamiliar to most. 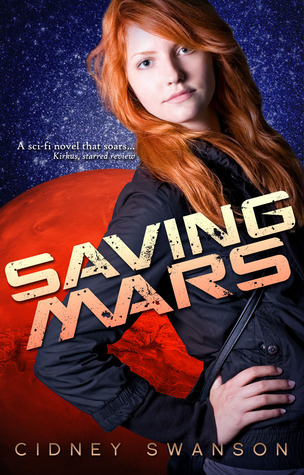 Jessamyn looks after her autistic brother and flies about Mars with intuitive abilities. The relationship between Earth and Mars is tense, with Earth having blockades to prevent the Marsians from leaving the red planet. However, because of difficulties in being able to grow their own food, the Marsians ocassionally raid Earth to gather food rations to bring back to Mars. A raid is being prepared, and Jessamyn and her brother are on a team planning to run the blockade, get to Earth, retrieve the necessary supplies and return. The trip isn’t without its casualties, but Jessamyn and her brother survive, only to get to the foreign planet, Earth, where a whole new set of obstacles await (the strangest of these is that of a body-swapping program). On Earth, Jess befriends a young man named Pavel, who is related to an important government official. Without knowing why Jess seems to lack some basic knowledge of human affairs, Pavel manages to be a tutor, and ultimately a bit of a savior. We can sense that there might be a romance blossoming (it is YA), but it is not fleshed out (yet). Mostly this read quite smoothly and enjoyably. There were times I felt that author Swanson spent a little too much time trying to explain some things worked. Or too much time trying to establish a back-story for things or people that didn’t need it. The stakes are high (good!) and our main characters necessarily have to step it up to survive and succeed. This is wonderful storytelling for an adventure/sci-fi novel. The characters seem real. But the settings tend to feel a bit contrived and sometimes forced. Even so, for YA space opera, this is a remarkable book. I’m actually looking forward to book two. Looking for a good book? This is fun, adventurous sci-fi for the Young Adult reader! I’ve looked at the genre of memoir for awhile, read more than a few, and wondered why it is that anyone would read a memoir by someone they didn’t know or by someone not ‘famous.’ After reading Leaving Rollingstone, I think I found my answer…to learn a little more about one’s self. And when you can do so with words so deliciously put together, such as Fenton’s, it makes the self-discovery a joy. Now I have to admit, despite my preceding paragraph, I do know Kevin, though I definitely learn a little about him (and myself) in this book. Kevin’s ability to get right to the heart of an emotion or evoke a memory through words is unparalleled. It is savory. There was a part of me that wanted to flash read the book — to get through it quickly because I so wanted to read the next portion. But there was another part of me that only wanted to read a little bit each day, to let his words linger with me because they are so carefully chosen and decidedly well used. It is poetic, in all the best sense of the word. 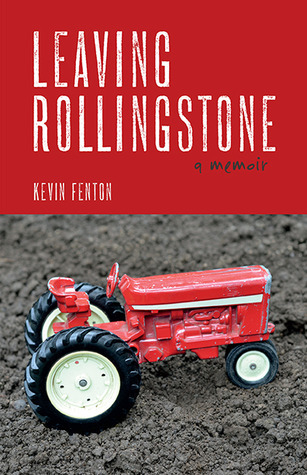 The book emcompasses a great deal of Kevin’s life…from early days on the farm in Rollingstone, through a period of alcoholism, to his life in the Twin Cities of Minneapolis/St. Paul and working in advertising. And while there is a great deal of sticking to a chronological timeline, this is not a chronological biography. He sets this up, showing how early influences act as pillars to what he will become; each moment defines us, and by looking back, we can see how the present has been shaped. I am nostalgic. I wrote this memoir because I have a crush on the past. I love the game Twister; streamlined toasters and ottomans with atomic/cocktail motifs; TV shows such as Laugh-In, The Avengers, Get Smart, and Batman; the originals of the movies Charade and Ocean’s 11; and the music of Dave Brubeck and Stan Getz. And this book appeals because Kevin isn’t the only one with such a crush. Those who grew up in the sixties and seventies have all come to a period in their lives when reflection waxes notalgic. There is a reason so many movies and television shows are sad homages to the past — those in charge have reached that age of reflection and often look to reliving a glorified past. But you can’t recreate old glory, you can only unintentionally mock it, or you can reflect on it, as Kevin does. I’ve known Kevin since our high school days. He has always been one of my favorite poker-playing friends (our poker days were not so much about playing cards but a means to sit with good friends and talk). Yet I learned much about him through this memoir. And, as I mentioned earlier, by learning about Kevin, I’ve learned some things about myself and my own history. Leaving Rollingstone is an homage to a gentle past that gave way to a turbulent time in a man’s life, and we understand that we all are leaving something, but that leaving something means a coming in to something else. Looking for a good book? This is a beautifully written memoir that evokes strong emotions and memories in all of us. Once in awhile you come across a book that defines the term “page-turner,” or in which you realize the truth to the idea of a book that you simply can’t put down. This is one of those books. This is, as the book cover proclaims, “a true-life novel.” Let’s be clear about that. 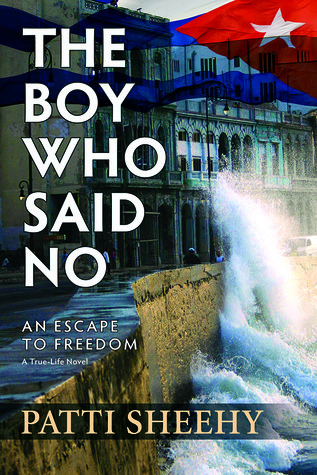 It’s a true story of young man, Frank Mederos’, escape from Cuba under the leadership of Fidel Castro. The story is told by the boy himself (now a much older man), to Patti Sheehy who tells the story with grace and charm and page-turning action. The story is, shall we say, somewhat ‘romaticisized.’ It is how Frank remembers it, along with a few things that he couldn’t possibly know for sure, but tells with confidence. Frank was a young boy when Fidel Castro took power in Cuba. He grew up seeing first-hand how communism was not the asnwer or the best thing for all Cubans. His family instilled in him the virtues of a free society — something they all longed for. Castro’s regime began a number of policies that affected Frank. First was a teaching brigade, in which young men who had been in school were sent to the rural villages to teach the families there so that all Cubans could be educated. Then came the draft to the Cuban military. Because of his cleverness and intelligence, Frank is promoted to an elite force where it seems that he is the best of all the soldiers; one whom all the other soldiers look up. His ocassional questioning of communisim and Castro’s regime put him at odds with his commanding officer, who looks for reasons to send Frank away as a dissident, but because Frank’s the best of the elite, this is hard for the commander to do. Before being forced to join the military, Frank met young Magda…the love of his life. Even as teens, with Frank in the military, they swear their undying love to one another. When Magda’s parents decide that their family will leave Cuba for the United States (still possible, though not easy), Frank is determined to escape Cuba and met them there. Magda’s father approves of Frank and approves of the plan. Nearly half the book is filled with the planning and attempting to leave the island. Because of Frank’s standing in the military, his disappearance is sure to cause a national man-hunt. While we admire Frank’s resolve, here is where author Sheehy shines. She takes on this journey, sharing every emotion with us — the highs, the lows, the anxiety, the love. Frank Mederos and Patti Sheehy make this an adventure story. And like any truly great story, there is a goal, there are obstacles, and there is love. This book is uniquely written so that adults will enjoy it, but children as young as middle-schoolers will enjoy it as well ( and possibly…gasp…learn something!). We learn a little about what oppression is like, and we learn a little about why people, the world over, give up everything (from family to material possessions) to have the opportunity for freedom. And we learn, very directly, that many make the ultimate sacrifice just for the chance at freedom. We never forget that Frank is telling the story, so we have some idea as to how it will turn out, but we are never quite sure what turn of events will happen to ensure this result, nor who will realize it with him. But sadly I have to take half a star away… while the book reaches its natural conclusion, it does not end. Even Patti Sheehy mentions this when she writes that there was so much more she wanted to know from Frank, who seems to smile and suggest that those questions might best be answered in the next book. Of course I will want to read that book! But I really don’t like books which don’t end. Looking for a good book? This is the book to read! True-life history political romance. You just can’t go wrong! Strange Chemisty continues to show that they will be a leader in YA sci-fi with The Almost Girl. Teenage girl/soldier/warrior/general, Riven, is on a mission. It will take us awhile to figure out what, precisely the mission is, but that’s part of the charm of this book…learning the back story as we move forward. What we do understand is that Riven comes from somewhere other than our current earth. Another dimension, it seems, though the science of this is not explained and not important to the story. Riven, under cover as a normal teenage girl in high school, shows signs that being a teenage girl is the same no matter what dimension you are in: jealous girlfriends, demanding teachers, and cute boys who make the cheeks blush (even when you don’t want them to). Add being a warrior on top of the regular pitfalls of being a teenage girl, and Riven has her hands full … keeping those teachers and jealous girls at bay, along with undead warriors sent to disrupt her plans. Complicating Riven’s plans are the fact that she’s falling for her target, Caden, and the fact that she’s slowly learning that everything she was taught, might just be a lie. Who does a teenage warrior girl trust, when she can’t trust anyone? I don’t want to give away too much of the plot, but suffice it to say that this book is full action, romance, and that necessary YA ingredient…brooding. All done quite well. There were moments when I wished the brooding would make way for the story, and moments when the story seemed to be there just to create more mood for Riven, rather than actually furthering the plot. A little tightened editing would have helped. Overall, though, this was intriguing, exciting YA sci-fi! And while I don’t typically comment on the cover art as it can change before publishing or with future editions, this cover will definitely draw people to picking up the book and reading the jacket copy. If it does this to you, consider making the purchase…it’s worthwhile! Looking for a good book? This YA sci-fi has everything you’ll want to keep you turning the pages! I have to admit that I’m a Star Trek nerd from waaaay back, and I actually liked those old Gold Key Star Trek comics. Not for the art (which perhaps goes without saying), but because it was a way for me to continue to get my Star Trek fix. I was only peripherally aware that there was a new Star Trek comic based on the reboot movies, so this review copy came as a nice surprise. 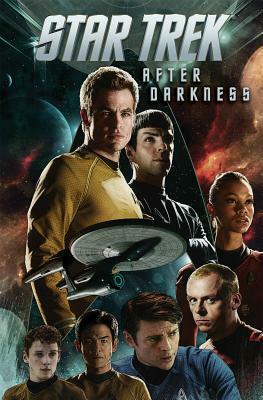 This graphic novel picks up shortly after the movie (Into Darkness). However, having seen the movie is not a prerequisite to reading this book. Unfortunately, having read some of the previous issues of the comic series might be. There are a number of references to previous issues — characters met, situations endured. Not being a regular reader, I can’t exactly refer back to an old issue or even fondly recall the moment. What works nicely is the sense of the characters. Although based only off of two new movies (and almost five decades of television history), I can hear the current actors’ voices in these roles, here in the novel. This is not as easy a job as one might think. I’ve read a fair number of Trek novels and too often I don’t hear the right character voices. What also works, is the artwork. Historically, I’ve felt that comics based on live-action actors, whether television or film, have suffered from art in which the reader can only occasionally recognize the drawn characters. This is not the case here. While still ‘comic book art,’ it looks good, and consistent, throughout. Something that movie producer J.J. Abrams has clearly been doing in his reboot, is taking pre-existing stories from the Star Trek history, and re-introducing them, with a twist, for his new crew. 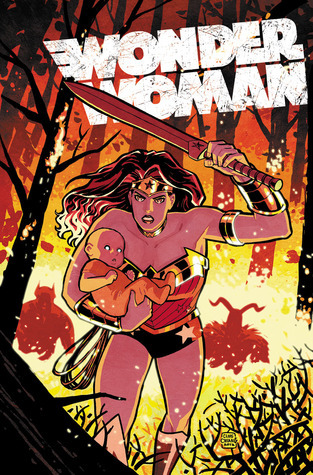 This IDW graphic novel picks up on this idea and runs with it. ‘Runs,’ perhaps, a little clumsily. I liked the storyline with the Gorn. For those not Trek-savvy, the Gorn is/was a race of giant reptiles in the first season of Star Trek, that Captain Kirk had to fight, mano-a-gato to save his ship. I very much liked the re-envisioned look of the Gorn. They were so much more threatening than the rubber suit with glitter-ping-pong-ball eyes that we saw back in 1967. However, the story seemed to end much too easily. There seemed to be no true conflict, and what little there was was easily overcome with a little talking (if only it truly were that easy). I do enjoy finding new stories for my familiar friends (and what Trek fan doesn’t consider these characters their friends? ), and maybe I even secretly enjoy the nod back to the original series with new twists on old tales, but above it all, I like good story-telling. Whether new story line or old, familiar characters or newly introduced figures, there needs to be a story. A plot. Obstacles to overcome, challenges faced and conquered…that’s what makes Trek work, and that’s not quite established here. Looking for a good book? A true Star Trek fan will enjoy seeing their friends in action, but there’s not enough story to capture anyone’s interest. SLEIGH RIDES, JINGLE BELLS, AND SILENT NIGHTS — Ronald D. Lankford, Jr. This sounds like it will be a fun ride, doesn’t it? This book mostly avoids the Christmas carol, or the religious songs, and focusses on the secular songs instead. However, the title of this book is quite misleading. 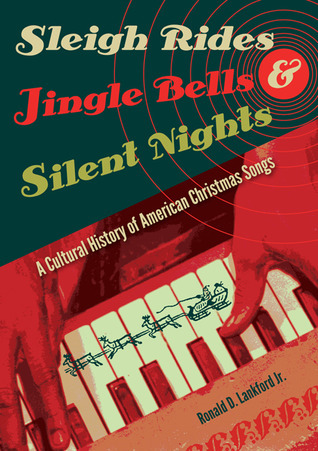 The songs “Sleigh Ride” and “Jingle Bells” and “Silent Night” are hardly mentioned, while other songs are researched and analyzed in depth. Lankford has even spent a few pages discussing a song called “Christmas Balls” by Ben Light and his Surf Club Boys. This was the only song in the book with which I was unfamiliar, so I looked it up — it’s a pretty rare item. Not exactly what one would consider a common Christmas song…even as a novelty song! Despite the clear academic aspect of this book, I found the first two chapters quite interesting. Knowing more of the history of some of our popular songs, as well as the culture of the times that produced the works was interesting, and in some cases eye-opening. But as the book progressed, I became irritated with the author’s ‘insight.’ Beginning with the chapter on ‘carnival’ I sensed Lankford was reading in to some of the songs much more sexual congress and innuendo than was necessary. Or, in other cases…so what?! Lankford writes pages on “Winter Wonderland” and spends a great deal of time focused on the opening verse, which is commonly removed. Five pages on this song, the removed verse, the added children’s version, only to sum it up with: “Romance, however, stubbornly persisted, claiming its corner in the holiday celebration.” I didn’t need to read five pages to get to this. I could have just listened to the song! From ‘carnival’ we move to the blues and the depressing nature of Christmas songs, and then to satire and the novelty songs (I never expected “Grandma Got Run Over By a Reindeer” to have been studied so thoroughly)! I would also admit surprise at how much the movie Gremlins figures in to this section of the book. This has never struck me as a ‘holiday’ icon. Yet there is no mention of “Home Alone” that I recall. But this started me thinking that this (Gremlins) was how Lankford actually views the holiday season. From this point on, I sense that our music and holiday traditions are nothing short of being Gremlin-like to Lankford. Cute, cuddly, and furry on the outside, but nasty and razor sharp when you get a more intense look at them. The influx of consumer culture and the strain it placed on the American family was deepened by a simple fact: Americans wanted to believe they could have it both ways. They wanted to believe they could step into—and back out of—consumer culture as it suited them; that there were good and bad forms of consumerism; that they could retain influence over children while filling the home with consumer goods; and that a group of people under the same roof could consume as individuals and still come together—especially at Christmas—as a family. Far from questioning these assumptions, the modern American holiday song supported these myths with few reservations. The delusion was so complete that even the Christmas song seemed unaware of itself as a commercial product. The “delusion?” This is how we end this study…with Lankford suggesting that our Christmas songs are a failure because we as Americans are failures…we want traditional values as reflected in the nostalgia of the songs, but that the songs haven’t kept up with the culture and that the song writers have been “unwilling” to show us these contradictions in song. But this isn’t a failure, it’s just part of the zeitgeist…we want it both ways and we don’t want to be told we can’t have it. Leave us alone to enjoy our Christmas songs and go take a look at how Rap is often closely identified with Shakespeare instead, why don’t you? Looking for a good book? This is probably only going to be found in very specific university classes.